No Need to Breathe Fire, Cool Off With Dragonfruit! - JP loves LIFE! One of the things that I’ve returned home with from various trips is a love of local foods. A three-week trip to Malaysia included a visit to a friend’s farm where he grows dragonfruit, a fruit he explained was imported from Vietnam. When I mentioned the fruit last week, Cheri Albritton at @ArveyColumbus wondered what I was talking about so I promised a few quick photos (but they were delayed 🙂 ). They are unusual in the US because they are tropically grown, but you can find them at some international markets. (In Memphis, I went to the Vietnamese market on Cleveland near Poplar.) And while I don’t know that anyone needs to eat tropical fruit everyday unless they live in the tropics, an occasional treat can really be reason to walk down memory lane. I have to tell you the plants are really weird looking unless you are accustomed to cacti. Although I need to find photos from that trip, here’s one from the web. with some information from a sit on the where you can best grow the yummy goodness. 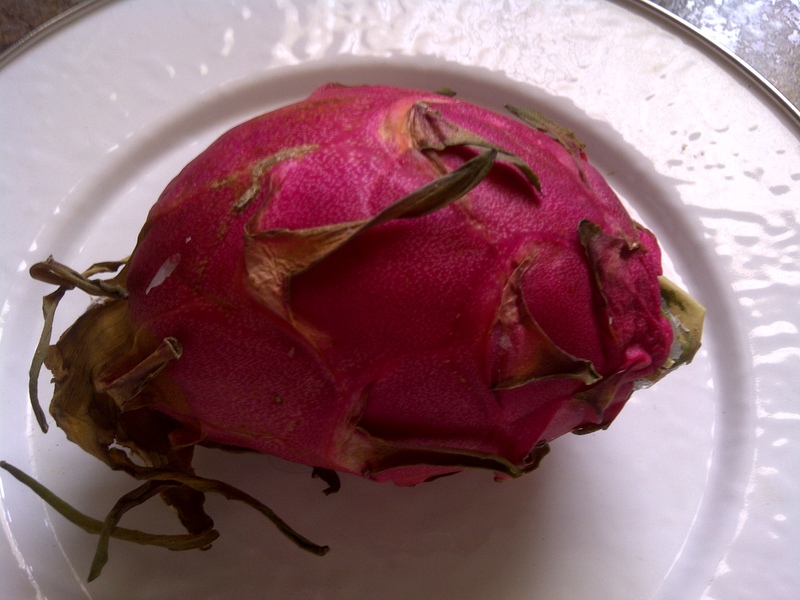 Growing dragonfruit commercially is a serious endeavor in Asian countries like Thailand and Viet Nam. Farms specializing in dragonfruit growing in Asia and commercial dragonfruit growing in parts of Central America and South America serve both their local dragonfruit markets and supply dragon fruit for export. This is the climate dragon fruit can grow in – with great dragon fruit growing conditions. While dragon fruit can be grown in US (we’ll talk about how to grow dragon fruit in California, for example), growing dragon fruit in Central America and Asia is still a long way ahead of growing dragon fruit in the US. Dragon fruit growing on the commercial scale requires knowing how to grow dragonfruit cactus to have more dragon fruits and knowing how to harvest the dragonfruit cactus fruit with the best compromise between picking the cactus fruit early enough that it can be shipped, but not so early that the cactus fruit has no flavor because it is unripe. Fruit maturing and flavor depend a lot, of course, on the dragon fruit growing conditions when the fruits ripen as well as the quality of the dragon fruit cactus plants. via Growing Dragonfruit Commercially | dragonfruit.Foodlywise. As far as how they taste, I think they are most similar to kiwi. And they have some differences — either white or deep purple flesh inside. I have to say in my experience the purple was better but when I asked at the store the other day the woman working in produce seemed to think I was nuts even asking whether it was white or purple inside. They are especially good on a hot day are being chilled. And I was taught to eat them with a spoon. The Pitaya fruit cactus or the Dragon fruit is a flowering vine cactus with large exotic blooms accompanied by big colorful fruit. The fruit is entirely fleshy and dotted with hundreds of small black seeds. The fruit comes in varying colors from pale pink to red and purple. One of the most common benefits of the Dragon Fruit is its capacity to control blood glucose which is very essential to diabetes prone individuals and people suffering from the disease. The dragon fruit contains high antioxidant properties such as Vitamin C, A and E. It has dietary fiber content of 1 gram per 100 grams and has 50% of the Vitamin C requirement of the human body which is enough to boost the immune system. The Dragon fruit has been found also to have the inflammatory properties to combat gout, arthritis and osteoarthritis. This is activated by its beta-carotene contents. It is low in fat and cholesterol as well. via Health Benefits of the Dragon Fruit. Have you ever had a dragonfruit? Is there a fresh fruit you connect to a trip you took? AWESOME! So you eat the fruit right from nature’s “container”? I need to track some of these down! Thank you so much JP. I’m glad you love more cool stuff in addition to COTTON. You rock! You are welcome! One of the great things, these are the kinds of fruits you can eat without much worry when traveling. A lot of very thin skinned fruits need to be avoided in countries with questionable water quality, but this dragonfruit, bananas, etc do not risk the contamination nearly as much from washing fruit as do say berries. Dragon fruit are really cool, although I’ve only ever had them twice I think. There’s a yellow skinned spiny species too (previously a different genus but crazy cactus taxonomists are always changing things) that supposedly tastes better but I’ve never seen one. Like many of the fruits not commonly consumed in the US they have a lot of potential as a new commercial crop and I hope to see them get more popular. It’s really something that there are just so many wonderful fruits like this out there that no one here has ever heard of. Funny thing is though, you can get dragon fruit plants everywhere here in the US, most everyone has seen one, and no one even knows it. You know those grafted cacti you see in stores that have the bright pink/red/yellow/orange part on top and green triangle part on the bottom? That rootstock? Dragon fruit. Probably not the best variety, certainty not the best cactus rootstock, but if you cut off the scion the rootstock should start to grow a dragon fruit vine (though I figure if you’re going to do that might as well go buy some cuttings or something). Wish I could grow them but the only cactus fruit that’ll make it outside here in Pa is my little eastern prickly pear. Thanks Greg for adding some thoughts! I think the age & size of the fruit producing plants is what really struck me. Where can i find dragonfruit in memphis tn?